Amongst genre fans, THE SLAYER is the stuff of legends. Not 1985's Larry Choen film THE STUFF but rather a legendary slasher film that is often cited as one of most influential horror films of the era. 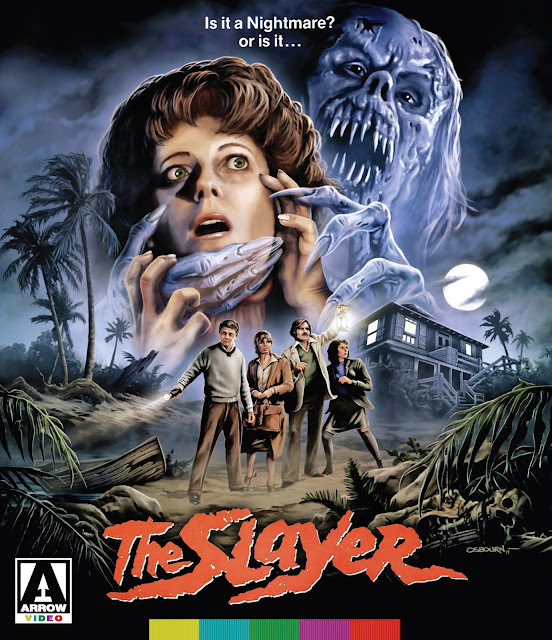 Previously only available on home video in truncated or full-screen versions, THE SLAYER (whose nightmares-seeping-into-reality theme predates a certain Wes Craven classic by several years) comes lovingly restored from the original negative in a stunning transfer that will be a revelation to fans both old and new. A pair of young couples heads off to a remote island home for what by all designs should be a relaxing vacation. But all hopes for a peaceful getaway are short-lived: as a storm threatens the island, anxious artist Kay can't shake the feeling that an unnatural force is in every corner of the island, aware of their every move. Kay starts to question if she is losing her grip on reality, or if her childhood nightmares of a demonic assailant are coming to terrifying life? The film is executed with a visual style and sense of confidence that was lacking in many of its contemporaries. While the film has more than enough practical gore to satisfy the most blood thrirsty horror hounds, THE SLAYER is competently made and satisfying on multiple levels. I'm not sure if it has the same cross over appeal as modern Art-House horror but I feel like fans of early Argento would be at home with Cardone's personal classic. The 4K transfer of the film is outstanding and gives fans of the film from its VHS heyday a reason to revisit this highly regarded landmark. You can purchase THE SLAYER here.